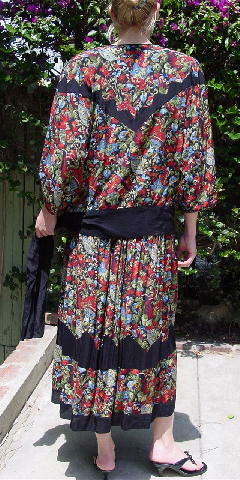 This vintage two-piece Diane Freis outfit is 100% rayon and was made in Hong Kong. It can be worn as separates. 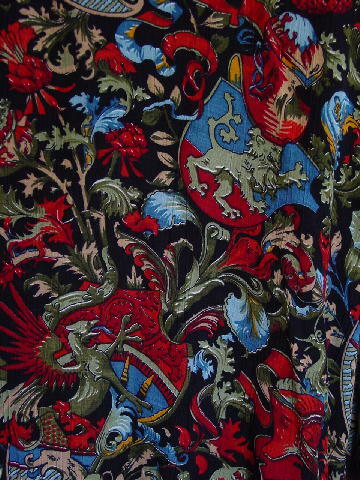 There is a black background with heraldry and medieval symbols in deep red, dark orange, light and medium olive green, light tan-bone, dark yellow, and light and medium blue, with touches of white. 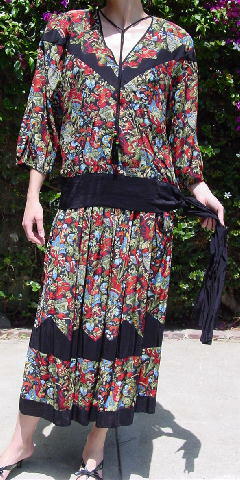 The blouse has a wide V neckline with two 20" black ties with black tassels and a red and green bead at the bottom of each one, and 3/4 length peasant sleeves (the elastic at the sleeve ends has lost its elasticity). The left side has a 2 1/2" side bottom slit with two 25" long by 4" wide black ties, which extend from the horizontal 4" wide bottom. 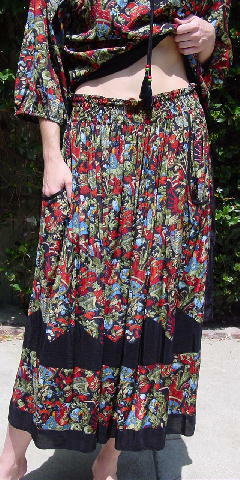 The full skirt has a 2 1/2" wide elastic waist with two front side angled pockets. shoulder to end of sleeve 19"
bottom hem side to side 25"